How Many People Can Fit on a Plane? More Than You Think! How Many People Can Fit on a Plane? Many More Than You Think! Most people think of a largely unpleasant, cramped, and annoying experience when it comes to air travel. After all, who doesn’t enjoy an overly chatty cat lady on one side and an over-sized coughing gentleman eating out of a burger king bag on the other? But have you stopped lately to appreciate the logistical marvel that lead to your joyful flight? We’re here to remind you that it could always be worse. So exactly how many people were on that airplane? More than there used to be. How Many People Can Fit on a Plane? The answer is simple, it depends. Though that answer is perhaps the least helpful to any fed up traveler, sadly there are just too many variables at play. First we must consider the type of aircraft. Secondly you must consider the configuration. Lastly, you must consider the situation. There are hundreds of different makes, models, and types of aircraft in use at this very moment – each of them with their own designated use and passenger capacity. For the sake of the capacity question, we will stick to the most popular passenger aircraft in use today. The configuration of a plane contributes significantly to its capacity. Is the plane set up like a cattle car where all the seats are coach? Is it a high-end international flight with sprawling seats? Or is it just a small commuter plane getting you to the next town over? Most people find their way onto a plane for the typical business trip or for pleasure. But as a means of travel from Point A to Point B, air travel has had many applications aside from the typical. When we consider planes used for search and rescue missions, transporting refugees, or even war, we must recognize that the situation lend themselves to much different capacities in terms of passengers. Nothing pushes things to the limit quite like the need for safety. In May of 1991, the record for largest number of passengers on an airplane was set on a Boeing 747 as part of Operation Solomon during which the aircraft carried 1,086 passengers from Ethiopia to Israel. The plane landed with two extra passengers as a result of two babies being born on the flight! The record for largest number of passengers to grace an airplane in a non-emergency situation is held by a low cost airline called Corsair out of France. They have configured their Boeing 747 airplanes with 524 seats – making for ridiculously cramped seating, but pretty affordable arifare. But, with the popularity of the oversized Airbus A380, this record will soon be forgotten. The Air Austral airline from France has an all-economy class Airbus A380 going into service this year that will cruise the friendly skies with 840 seats! That is one HUGE double-deck flying sardine can. The Air Austral Airbus A380 would carry more passengers than this gigantic cruise ship. 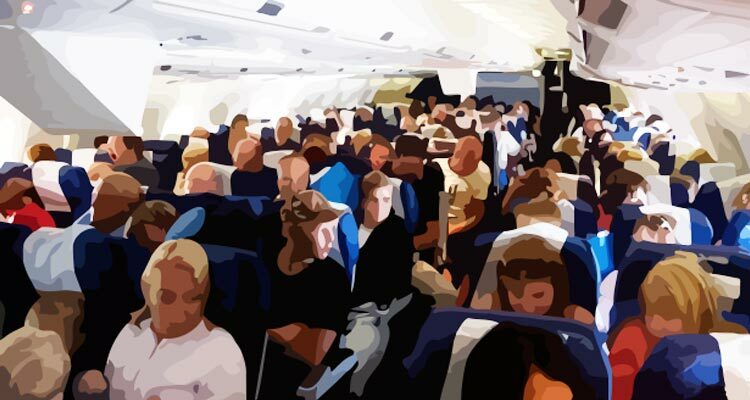 While we know that the number of people on any particular aircraft is affected by a multitude of factors, let’s get back to discussing that cramped domestic flight that got us here in the first place. For those of us who have been traveling coach over the last few decades, the trick of the incredible shrinking airline seat has become ever more apparent and a whole lot less entertaining. As the American population continues to grow both taller and ever-wider, airline seats have otherwise gotten smaller. So no, it’s not just you. The math is simple really. Back in the 1960s, the standard width of an economy class seat was a comfortable 17 inches. Then, for a short period in the 1990s and 2000s with the introduction of some of our larger aircraft like the Boeing 777, some seats reached a whopping 18 to 18.5 inches in width. But today, the average traveler is looking at about 16.5 inches and the need to fight for use of the armrest. By making their seats smaller, airlines have been able to increase the number of economy seats per aircraft and with commercial flights flying on an average of 80-85% capacity, this means more revenue. So how many people can fit on a plane? The easy answer is more than used to. For more information than most folks would ever want to know regarding aircraft capacity give this resource a look.